A study showed that increasing N treatment concentrations led to increased concentrations of valuable chlorophyll in two commercially available purslane cultivars. Credit: Dean Kopsell. Although purslane (Portulaca oleracea) is considered a problematic weed in the United States, it is grown and consumed as a leafy vegetable throughout much of Europe, the Middle East, Asia, and Mexico. Valued for its nutritional qualities, purslane contains important phytochemicals such as omega-3 fatty acids, organic acids, and important flavonoids. The succulent annual can also contain high concentrations of carotenoid and chlorophyll pigments. The authors of a study in the June 2016 issue of HortScience say there is increasing support for the role of dietary carotenoids and chlorophylls in the protection against harmful chemical mutagens and carcinogens. "Nitrogen (N) can influence phytochemical quality factors, and recent studies demonstrate that N can alter carotenoid and chlorophyll composition and accumulation in leafy specialty crops," noted authors Dean Kopsell, Kimberly Whitlock, Carl Sams, and David Kopsell. 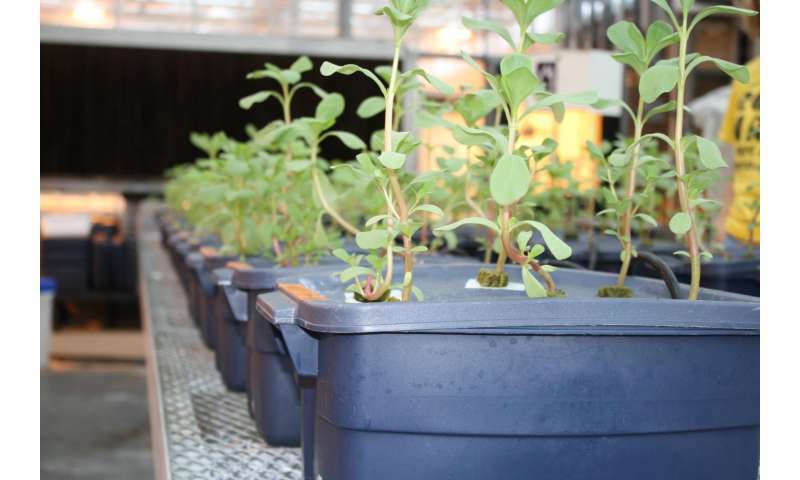 To measure impacts of N fertility levels on pigment concentrations in purslane, they performed experiments with commercially available 'Golden Leaf' and 'Green Leaf' cultivars. The researchers grew both cultivars in nutrient solution culture under increasing N concentrations of 13, 26, 52, or 105 mg·L-1. They then harvested the plants (45 days after planting), and measured for concentrations of shoot pigments using high-performance liquid chromatography methodology. Results showed that increasing N treatment concentrations acted to increase the concentrations of valuable chlorophyll in both purslane cultivars; the increases were most dramatic for 'Green Leaf'. The biomass parameters measured in the study were not impacted by the interaction of N treatment concentration and purslane cultivar. "Purslane in the study accumulated high concentrations of carotenoid phytochemicals," the authors said. "Nitrogen treatment significantly influenced shoot tissue beta-carotene, lutein, neoxanthin, total carotenoids, chlorophyll a, chlorophyll b, total chlorophyll, and the chlorophyll a to b ratio in purslane shoot tissues." The authors recommended that N fertility management and cultivar selection be considered when producing purslane as a nutritious specialty vegetable crop.